When Virgin Trains East Coast (VTEC) was launched on 1st March 2015 the operator had its own logo and all announcements and publicity clearly stated 'Virgin Trains East Coast'. This was still confusing as Virgin Trains on the west coast never officially changed their name to Virgin Trains West Coast so many people assumed 'Virgin Trains' was the master brand that covered both franchises. This has never been the case. 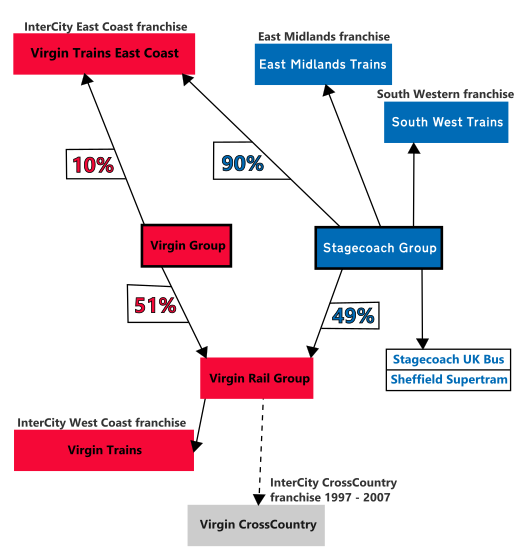 As this organisational chart shows Virgin Trains East Coast (90%) is majority owned by Stagecoach Group, ownership wise it's closer to East Midlands Trains and South West Trains than it is to Virgin Trains which is majority owned by the Virgin Group (51%). Now to make things more confusing towards the end of 2015 they dropped the 'East Coast' part in a lot of their publicity materials as well as their on-board announcements, referring to themselves as simply Virgin Trains. It certainly does matter because neither of the Virgin Trains franchises can help you with problems with the other. So if you contact 'Virgin Trains' (which is the west coast operator) about a problem on your Newcastle to London train (after all the announcements on board clearly said Virgin Trains) they can't do anything to help you and will then have to direct you to Virgin Trains East Coast which takes longer for the customers complaint to be dealt with, needlessly takes up time of the west coast customer relations team and, to the customer who thinks they're both the same company being overseen by Richard Branson, they think it's just two departments within the same company passing the buck. None of this is a good experience for customers. Separate companies, separate policies you can't assume what applies to one Virgin Trains franchise applies to the other. The catering offering is different (the east coast is generally better), weekend upgrade rates differ, peak time restrictions are different, the WiFi policies in standard class are different (VTEC gives free WiFi in standard class but only if you book direct with them, this causes confusion as people book on the 'Virgin Trains' site and wonder why they didn't get WiFi codes) and only Virgin Trains on the west coast has any form of automatic delay repay at the moment. If they bring automatic delay repay to Virgin Trains East Coast in the future it will only be available to those who have booked direct with them, which will just confuse and annoy those who booked their VTEC tickets through 'Virgin Trains' thinking that was the right place. We've mentioned before that the implementation of Nectar in the Virgin franchise is a joke. We know the scheme is rubbish, but they still could have made things better than the implementation we have currently. If you choose Flying Club miles it's even more of a mess. Virgin Trains (west coast) have now halved the miles that you earn, whereas Virgin Trains East Coast have left earnings unchanged for now, the same rule of booking on the correct site applies. The easiest solution is to make it clearer that the franchises are separate. The problem at the beginning was although Virgin Trains East Coast used to highlight the East Coast part the west coast was still simply Virgin Trains so it wasn't clear to the average passenger that Virgin Trains was strictly the west coast operator. The site virgintrains.co.uk should cease to be the west coast website, which should move to virgintrainswestcoast.com and the generic Virgin Trains site should contain general marketing material with links to the correct franchise. The @VirginTrains twitter account should be renamed something that makes it clearer it's a west coast account and then a new @VirginTrains account created to catch messages from people unsure who to tweet. The idea is the twitter teams reply from their respective west/east coast accounts but the central one is there to catch any Tweets from uncertain customers. It's not ideal but it would make things clearer than the current approach. Currently on the west coast site (which still just says Virgin Trains in most parts) there is a redirect that's supposed to catch you if you're doing an east coast booking and offer to redirect you to the correct site, unfortunately it only works in the most basic of situations and shouldn't be relied on.